Members of The Marcelino Team are helping with The Woods at Throckmorton Manor this year with proceeds going to Making Strides Against Breast Cancer - Vermont. Are you afraid of the dark? Our guides will take you down the wooded trail where things scurry at your feet, dangle from above OR jump in the night! Visit The "Woods" at Throckmorton Manor! Pre Buy Tickets for $11.54 per person or $15 at the event with proceeds donated to Making Strides Against Breast Cancer in Vermont! Tickets can be used on any of the 4 nights, not just the specific night you purchased them for, and are for one use! First group departs at Dark (about 6:00) and groups will continue to go through until 10:30pm. Due to high startle, this event is not recommended for children under the age of 13 years old. The Marcelino Team will be at the Making Strides Against Breast Cancer event, but not as a company, as a family! Don's wife, Shannon's Mother, Denise heard those words "you have cancer" 6 years ago, she fought the fight and is a SURVIVOR! 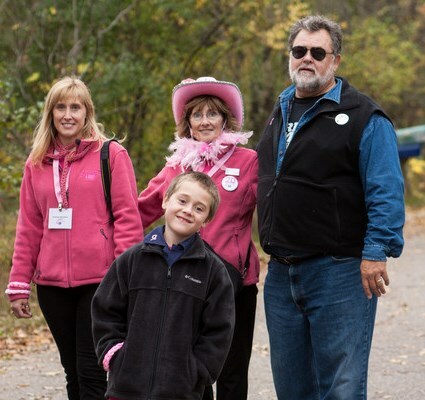 Denise and Shannon joined the Making Strides Against Breast Cancer Walk 6 years ago, 4 of them being on the planning committee, creating the team Wings of Courage and have not stopped! Shannon's son Matthew, 8 at the time, joined their team and has been pushing hard to fight breast cancer by bringing fundraisers into his school. The past 2 years all 3 of them have become Pacesetters, meaning they each raised a minimum of $2,500. Matthew has been the youngest Pacesetter in the State of Vermont for the past two years! Last year with 4 Pacesetters on their team they were able to raise a little over $11,000 and hope to exceed that number this year! How will they do that??? WELL, they are helping in a very Haunting Event called The Woods at Throckmorton Manor! It is a spooky walk through the woods that is WILL scare you. All proceeds to benefit the Wings of Courage team of Making Strides Against Breast Cancer. Fore more information or to pre-buy discounted tickets, CLICK HERE! If you would like to donate to a participant on the Wings of Courage team or would like to join in on the event CLICK HERE!